How much would you pay to rent a condo in downtown Toronto? How about the U.S. island of Saipan (a fun little island 7,800 miles from Washington D.C.)? You probably can only give a reasonable answer to at most one of these places, and even then you would probably answer it with a question like “In what neighborhood?”. Like most, you would start looking at comparables. What is the going rate these days? According to BNN, the average monthly rent in Toronto is about $2,166, while googling around about Saipan finds places for $500. “Oh this must make sense from a supply and demand standpoint”. Maybe.. If you sat down and compared 4 or 5 condos in either one of these markets you could make a reasonable decision about which is the best value compared to the others. But what about the fact that you’re starting at $2,166 or $500? 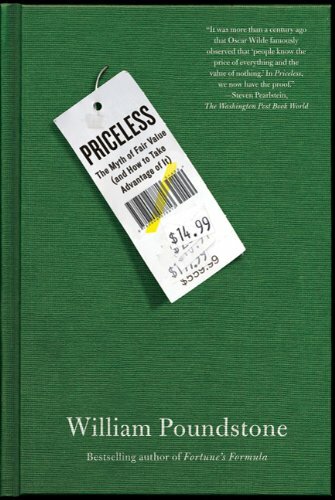 As you will learn when you read Priceless: The Myth of Fair Value (and How to Take Advantage of It): , humans are q) very good at understanding relative value but are horrible about understanding absolute value, and 2) we can be easily misled about what “absolute’ value is. As we talk about frequently on this blog, humans are terribly fallible, and we are particularly fallible to incentives and prices. Charlie Munger (Vice-Chairman of Berkshire Hathaway) even has this as his #1 Standard Cause of Human Misjudgement! When talking about investing, being as conscious as you can be of how prices work and can influence you and others is extremely important – both from understanding what a business is worth and understanding the actual business and its model. The author William Poundstone has done a great job of putting together the foundations. It provides entertaining overview of the beginnings of Behavioral Economics, covering Ward Edwards, credited as one of the founders of behavioral decision theory, to Amos Tversky and Daniel Kahneman, the creators of the Prospect Theory. It also gives numerous case studies of how people as a whole can be consistently manipulated (and how even if you are aware of this you can still be susceptible). For example, the book covers numerous examples of anchoring, such as the ID Number experiment by University of Virginia psychologist Timothy Wilson (“basic anchoring effect”). “Wilson and company tried to find out how subtle a ‘background’ anchor could be. In one experiment, volunteers were given questionnaires with adhesive notes attached. Written on each sticker was a four-digit ‘ID Number” between 1928 and 1935. One group of participants was required simply to copy this number onto the questionnaire. They were then asked to estimate the number of physicians in the local phone book. The average estimate was 221 doctors. The important thing here is that the ID code was just a number that happened to be there, not a meaningful part of the problem. Other groups were given slightly different instructions that caused them to pay a little more attention to the ID number. Some were told to note whether the ID number was written in red or blue ink (on the pretext that this would determine which page of the questionnaire to fill out). For these people the average answer was 343 doctors. A split second’s extra attention to the number has raised the estimate 55%. (All the ID numbers were big. As anchors they would have pulled the estimate up). Another group was asked to note whether the ID number was in the range of 1920 through 1940 (they all were)….This group [averaged] 527. One group was asked [first] whether the number of physicians…was greater or less than their ID number, and then give their estimate of the number of physicians. This group’s average was 755…. Another fun example is the Beer Problem posed to university students by Joel Huber and Christopher Puto, then a professor and grad at Duke University’s school of business. “Joe Sixpack is reaching for a brew on the market shelf. There’s a premium beer that costs $2.60, and a bargain brand that’s only $1.80. The premium beer is “better”…rated at 70 out of 100 in quality, while the bargain brand is only 50. Which should Joe buy?….The students preferred the premium beer by a 2-to-1 margin…. Another group chose among three beers, the two above and a third with a rock-bottom price of $1.70 and a quality rating in the basement (40). Yet it affected what they did choose. The proportion of students choosing the original bargain beer rose to 47%, up from 33%. The existence of the super-cheap beer legitimized the bargain beer. There are numerous examples of every day life things that can be adjusted to change your decision. The book covers restaurant menus, strategies used by luxury goods companies like Prada, lawsuits, and even negotiation strategies. It also includes some techniques on how to avoid falling for these traps, like Antidotes for Anchoring where you force yourself to Consider the Opposite, or the Buddy System – techniques that can be applied to analyzing companies. As we here focus (primarily) on understanding businesses, the real question always comes down to “how much is the business worth?” In turn, it’s worth doing everything you can to understand how humans think of prices. If you like this book it would also be worth checking out Misbehaving: The Making of Behavioral Economics by Richard Thaler. Saturday Morning Video - Petter Johansson: When you make a choice, are you really sure you know why? When you make decisions, you like to believe you made them for a reason. This is particularly true of investing. I bought this stock for rational reasons, right? We recommend watching this TED Talk by Petter Johansson, which discusses Choice Blindness. His experiments explore that our rationale for the decisions we make might not be as strong as we would like to believe, and that we can actually end up justifying opinions that we didn't even make (as you will see in the video). Of course, when you're investing, you need to remember you are fallible. That's why we here believe 1) You have to be very careful how you frame questions when learning about something from someone and 2) document your own decisions and reflect on your answers later, and 3) use a checklist whenever possible (see Checklist Manifesto).